In the second volume of Proust's great novel, the narrator emerges as an actor in the drama of his own life. Swann has now dwindled into a husband for his former mistress, Odette, and their daughter, Gilberte, becomes the adolescent narrator's playmate and tantalising love object. We move from Paris to the seaside town of Balbec, from ritualised social performances to midsummer spontaneity and from Gilberte to her successor, Albertine. 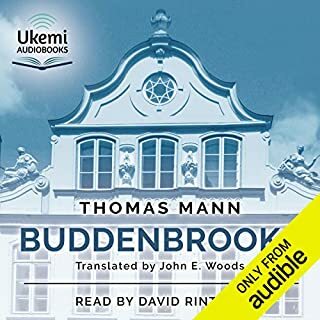 In Balbec, the narrator is befriended by the painter Elstir who introduces him both to the craft of painting and to the mysterious 'little band' of girls. An artistic education is thus intricately interwoven with a journey of sexual self-discovery. This is now the entire audiobook, not in two parts. 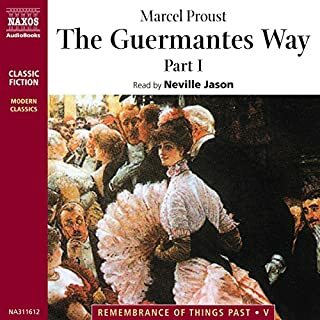 ©2008 Marcel Proust (P)2014 Audible, Inc.
Proust writes marvelous stuff, but his interminable sentences can make his work difficult to read. Now, John Rowe to the rescue: he reads so sensitively, it's like listening to one's own thoughts. I was so glad to find he's started another volume of Proust's masterwork, and look forward eagerly to the second installment, and hopefully more to come. 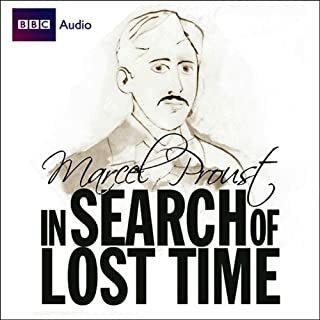 Insomniacs, take note: with Marcel Proust/James Rowe on your iPod, you may be able to jettison the Lunesta. I mean this in a good way (and I think that Proust, who wrote at night in that cork-lined room, would have approved): the narrative is absorbing, complex, seductive, and nonlinear, perfect for bedtime (or the wee hours of the night), as it hardly matters where you leave off or pick it up again. 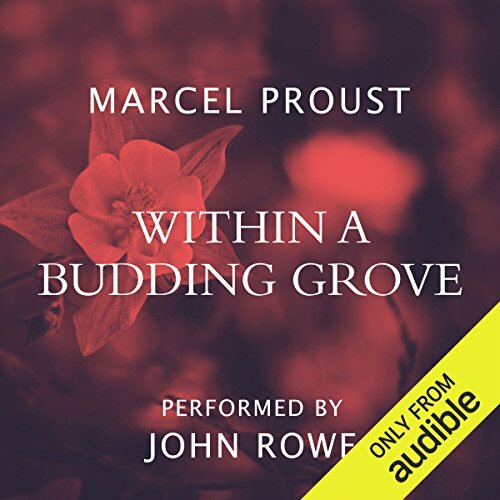 having now completed the second volume of proust's amazing seven volume work, i am more convinced than ever that the ONLY voice for proust's narrator is john rowe. more, please. Rowe's performance feels less arch than Neville's. I like them both but preferred Rowe, this time around. I only wish Rowe had finished the series. Or, if he has, I wish Audible would make the rest of it available. Impressive narration by John Rowe. Volumes 1 and 2 are brilliantly done. So disappointed in the narration on Volumes 3 and forward. Good for lovers of Proust and know how he writes. The narrator has the correctly sensitive voice. Beautifully written ending. John Rowe made this listening experience possible for me. Other readers, at least via the samples, were bad to awful. Please encourage John Rowe to complete the series with his wonderful narrative style. I've finished the first two volumes on audio book, occasionally reading on Kindle with the second volume, but I find it almost easier to follow John Rowe's narrative (though I read all six volumes in the tiny-script hardbacks back in the 90s). 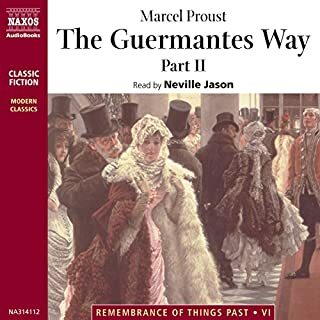 Now I'm listening to The Guermantes' Way, with the Neville narration. Just started. Maybe I'm in the transition phase, but I really miss my friend John Rowe. He took me through the labyrinthian sentences so smoothly. Maybe I'll grow to like Neville, but at the beginning of volume three he was too fast and didn't lead me as effortlessly Rowe. Anyway, apparently there is no choice. Rowe only recorded the first two volumes. (If I'm wrong let me know). I have not dipped into newest written translations, which are said to be really good. And after I finish this round of Proust (with the Moncrief translation), I'll start again with the contemporay one). But Moncrief is so good, so good I don't know if I'm hearing Proust or Moncrief (or Rowe). But that's the nature of translation. Whatever the case, Proust is worth a go. He's not right for everyone. I have friends (novelist friends who can't get into it). But I can. At any rate, dive into Proust, via book, Kindle, or audio. If it doesn't stick. Take a year off. Try again. If it still doesn't stick, you have every right to quit. Reading Proust is always about TIME (among a million other things), and maybe the time is not right for you now. Rowe's reading is brilliant. In fact, I've found the whole work more accessible and seductive as a listen than I did as a hard-copy read, thanks in large measure to Rowe's sensitive and often illuminating performance. I can't wait for the rest of the volumes to be available. 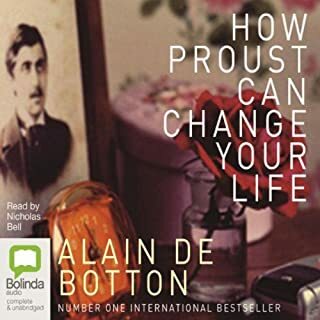 Proust is life changing, and Rowe brings the words to life. Get this one now! "Like floating down a river..."
Beautiful book and beautifully read. I've heard reading Proust feels like floating river and I couldn't agree more. 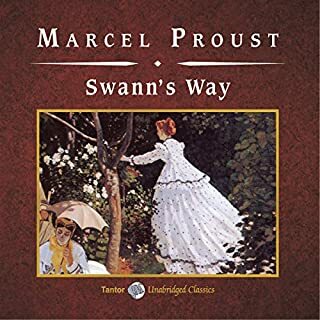 Listening to Proust however, even better!